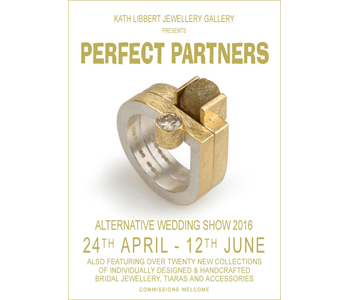 This Spring Kath Libbert Jewellery Gallery is celebrating ‘partnerships’ with a striking exhibition of precious special occasion rings. 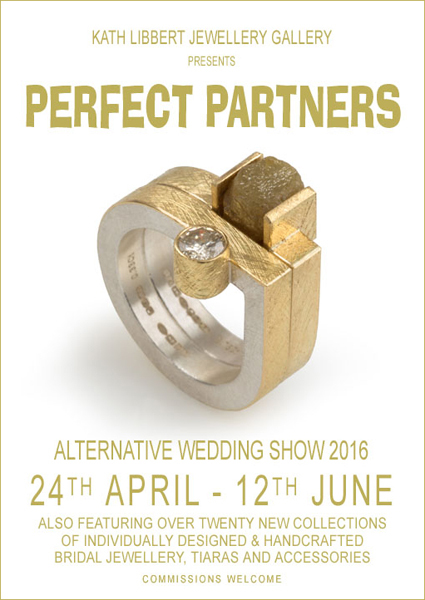 Bringing together the work of six internationally renowned goldsmiths, Perfect Partners explores the magical chemistry of close creative collaborations as well as exciting juxtapositions of complimentary and contrasting materials in jewellery that encapsulates perfect partnerships. London based partnership Shimell and Madden occupy that space where craft, art and fashion intersect. Their jewellery explores themes of science, nature and time. Emma Madden’s expertise is in craft and conceptual design, inspired by the universality of mathematics. Luke Shimell’s extensive experience as a goldsmith enables him to develop their designs into intricate pieces of exactitude. Their astronomical collection ‘Orb’ embodies celestial harmony featuring deep red cabochon garnets, fiery orange sapphires, and a flash of diamonds set in richly textured yellow gold rings. McCaul Goldsmiths, another London based creative partnership, are brothers and both classically trained goldsmiths, whose style and forms are heavily influenced by technique and the properties of the metals. David and Barry, originally from Ireland, create elegant jewellery that accentuates the curves and contours of the body. Rings gently meander around the fingers, precious metals are hand-forged into sweeping tapered loops, curves highlighted with lines of pavé set tiny diamonds, colourful gemstones inspire one-off creations. Opposites attract and Josef Koppmann utilises this concept in pairings of rings which juxtapose rough hewn diamonds with highly polished ones. Focussed on impeccable craftsmanship, Josef creates bold imaginative jewellery characterised by minimalist, architectural clear cut lines. Textured chunky silver with fused rich 24ct yellow gold settings and surfaces create an exciting interplay of light and shadow, where the fine gold reveals its vivid and intense colour. Diana Porter’s ‘Strata’ collection of stacking white and yellow gold rings emulates the way life and relationships change over time. Her surrounding environment provides inspiration to the technique behind this collection, as with deep etching she mirrors the subtle eroding effects of her Cornish landscape. Set with opulent rich red garnets and twinkling diamonds these rings nestle snugly together and can be added to over the years to mark significant milestones in one’s life. Londoner Jo Hayes Ward constructs interlocking symbiotic rings from small building block elements of gold and platinum creating elegant pieces with an architectural aesthetic. The shimmering multifaceted surfaces dramatically catch the light with movement and this effect is enhanced by the glint of precious gems. Crafting in a digital environment Jo employs rapid prototyping technology alongside traditional jewellery techniques in the production of her work, which together with her deep knowledge of materials has enabled her to develop her unique signature as a maker of timeless, modern pieces, which come alive when worn. Amanda Mansell is inspired by the Buddhist ensō the circle symbolising the beginning and end of all things: infinity, enlightenment, togetherness, open, closed, wholeness, completion. Her recent award winning ‘Concentric Circles’ series of amazing interconnecting gold and gemstone rings grow over time; each ring gradually closing the circle until it is complete. They appear to be almost ‘spooning’ each other, encapsulating ideas surrounding the engagement, wedding and eternity ring as a couple take this journey together as Perfect Partners! Perfect Partners also presents a sparkling array of new collections of wedding and engagement rings, tiaras, cufflinks and bridesmaid jewellery by a wide range of renowned jewellers including Mirri Damer who has made wedding rings for Dawn French and Malcolm Morris who created the tiaras for Gwyneth Paltrow in Shakespeare in Love. As always a personalised design service is a strong feature of this year’s Alternative Wedding Show, and Kath Libbert Jewellery Gallery is addressing the current trend for working heirloom jewels into contemporary designs by specially featuring jewellers who will work to commission and create bespoke pieces for the gallery’s clients. creative collaboration, inspiration and distinctive techniques. Refreshments will be served throughout the afternoon. All very welcome! McCaul Goldsmiths; Josef Koppmann; Diana Porter; Jo Hayes Ward; Amanda Mansell. Also presenting new precious collections by: Alexis Dove; Graeme McColm; Poppy Dandiya; Mirri Damer; Malcolm Morris; Mark Nuell; Adele Taylor; Mia Chicco; Mikala Djorup; Joanne Tinker.